Many piano students have issues with stretching. Smaller hands are less suited to playing the piano than larger ones, and they often need a little more help when learning certain repertoire. Playing hefty chords and intervals of an octave (8 notes) or more, in either hand, can create physical problems, causing the hand to ‘lock-up’ and subsequently become tense, curtailing fast movement. This can also happen even when chords are negotiated relatively easily; fast double octave passagework, octaves with the melody in the top line (or bottom line), quick chordal passages, and chords which leap around the keyboard, are all potentially troublesome for the smaller hand. It’s occasionally possible to re-write passagework in order to play successfully, but a better plan is to train the hand and fingers so that they become accustomed, and indeed prepared, to play large intervals without any strain. Here are a few ideas and suggestions to help prepare the fingers and hand; it is possible to re-train yourself mentally and physically, allowing the hand and whole upper body to feel free and unrestricted whilst stretching octaves and beyond. Place your hand (or hands) on a table top (or your knee) in a totally natural position, stretching out as far as is comfortable, with no tension (see photo below). Observe how each hand feels as you stretch out whilst relaxing your arm(s) and upper body; it’s important to sense what is completely relaxed. Next play an octave interval on the piano in each hand (one at a time), again feeling totally relaxed (this might only be an interval of a 6th or 7th if you have small hands or an octave feels tense). If you can’t yet reach an octave, a flat hand position (i.e. the whole hand out-stretched as on the table top in the photo above) might be necessary at first so that you can actually reach the interval. Whilst playing the interval, observe the thumb and 5th finger; the two fingers you will normally be using to play any interval (although after a while you may be able to use the 3rd and 4th fingers alongside the thumb for octaves as well). How they negotiate any wide interval is vital. Firstly, try to ensure that the 5th finger in each hand is active and working independently from the rest of the hand. 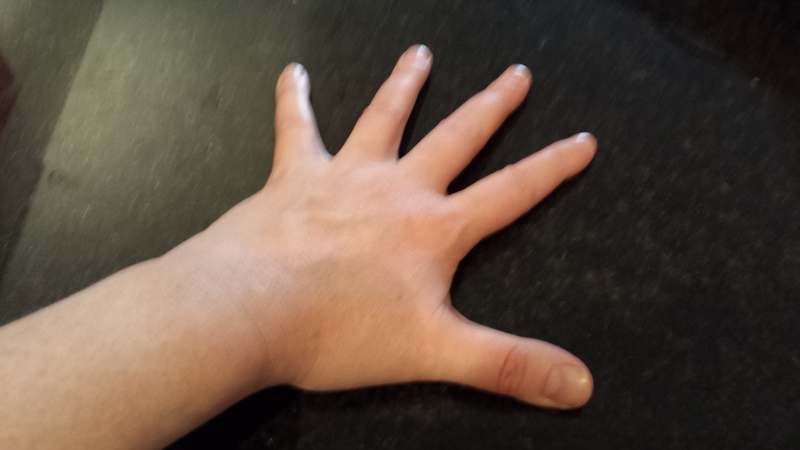 Employ your finger-tip on the key using the fleshy area of the tip, and be fully functioning from the knuckle down to both finger joints; it is best if the 5th fingers are bent and in a ‘gripping’ position (see photo of my left hand below – my right hand was busy taking the photo!). Also notice the bridge position of my knuckles i.e. the knuckles are all visible; if this bridge ‘collapses’, then playing at speed outstretched (which is necessary for octaves and chords) becomes problematic. The thumb should also assume a ‘gripping’ position, as this helps with note accuracy. It will probably take a while for these finger positions to feel natural; it takes pupils generally six to nine months of constant hand/finger mindfulness. Whilst playing the interval, allow your wrist and arm to go floppy and relaxed. I ask my students to move their wrists freely up and down, as they are keeping the position of the chord or octave; it’s best to start practising using an octave – inner notes can be added later. 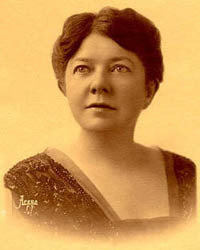 Playing the piano is all about tension to play the notes, and release or letting go immediately afterwards, and so chords and octaves also require this approach. 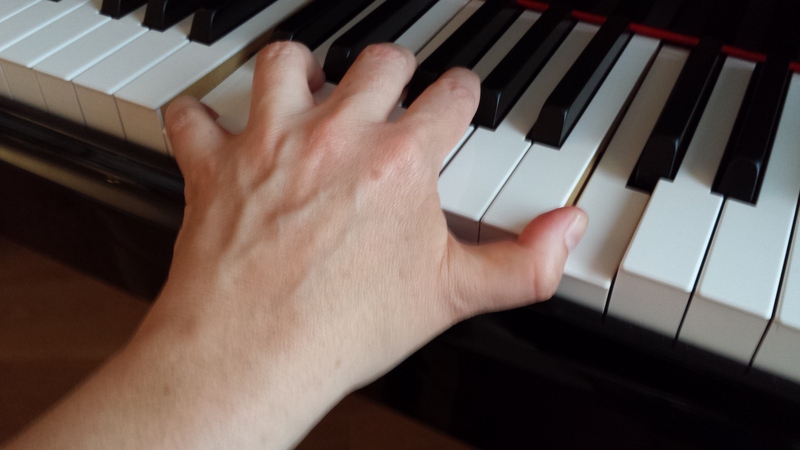 The idea of encouraging the hand/wrist/arm to go floppy and limp whilst keeping the interval shape with the fingers needs to be practised frequently, so it becomes a habit, and eventually it will feel natural when playing larger intervals. It’s a good idea to get into the habit of ‘letting go’ of the octave as soon as it has been played. However, this doesn’t mean you need to physically let go of the notes or piano keys. It’s possible to hold notes, chords and intervals without assuming a tense position, hence moving the rest of your hand should feel easy and flexible as you hold onto the notes. This is really like an exercise in assuming the interval shape. Try moving your whole arm/hand in a circular/rotational motion whilst still holding down a chord. If this feels relaxed and ‘free’ then you know you are on the right track! Always release the hand position completely after you have played a one or two intervals or chords – otherwise you might feel strain or discomfort. Sink into the key bed as you play the octave interval ensuring your wrists remain free and not in a high position (high wrists usually indicates tension), It’s quite good practice to allow the wrists to drop as low as possible as well as moving freely in a rotational motion as already suggested. Avoid a ‘fixed’ wrist position, but rather encourage it to move as and when necessary helping you reach each and every chord or octave. The wrist should act as a hinge allowing arm-weight to produce the sound. Once you feel comfortable playing an octave, practice this stretch every day for around 5 minutes. Muscles will get used to the feeling of the stretch so that it feels like a ‘normal’ hand position. Then eventually add inner notes to create chords. Your hand will adjust to this new position and you might notice a change in the structure of your hand too. This exercise should never be uncomfortable or cause pain in any way. If you feel pain whilst playing the piano then something is wrong, so stop and get help! If you want to develop a good piano technique finding an appropriate teacher is paramount. After working systematically on this technical issue, you might find playing intervals of a ninth and even a tenth possible, as your hand gets used to stretching further and further without feeling strained or tense. It’s all about relaxing the hand so it feels more accommodating and pliable, whilst keeping a firm finger grip on the octave/chordal shape. Happy practising!